Lincat is launching two new products – the Opus 800 and the latest version of FilterFlow water boilers. The Opus 800 is a visually and functionally appealing 80-strong range of prime kitchen equipment. It includes fryers, griddles ovens, and grills which are larger, heavier, and more durable. It is energy-efficient, with enhanced performance and excellent serviceability. The FilterFlow water boilers include an eco-friendly model with improved self-diagnostics, timer modes, and filter cartridges with much longer life. They are easier and quicker to use, cheaper to operate, and have an overall smaller footprint. Meanwhile, Glen Dimplex Professional Appliances (or GDPA) is premiering their new Titan Induction Range Cooker. With front-line induction technology, this British-manufactured cooker includes a distinct five-zone induction cooking stove, each of which includes an individual ‘boost’ mode for additional power, finished off with a large 2/1 gastronomy compatible oven. It also has the option to connect as either a single or three-phase solution for sites. Catersave Europe features their Odour Management System - the only system that effectively destroys odour molecules. This system uses a plant-based liquid which is dispensed directly into your kitchen ducting. This cleans the air by destroying the molecules that cause the odour. This system is designed for use in catering establishments such as hotels, restaurants, and cafes. Panasonic UK’s new slow juicer is compact, quiet and easy to use. The innovative juicer uses a crushing method instead of the traditional shredding method many juicers utilize. This extracts an overall higher juice content, rotating stainless steel to press and crush ingredients, retaining vitamins, nutrients, and anti-oxidants as a result. In a test against a standard branded speed juicer, it produced 20% more juice. Squeezing while preserving nutrition. Prodis is initiating its T-series collection of hood dishwashers. The T1115 model is high-quality stainless steel, which can withstand continual use in harsh commercial kitchens. It has a 15-litre wash tank capacity, and 6-litre rinse tank capacity. It also features automatic timed detergent and rinse aid pumps, both primary wash pump filters, and secondary tank filters, and a temperature display indicating operating temperatures. The heat recovery system recycles waste heat into the machine, saving energy while reducing steam. Ascentia FSE is premiering its counter-top oven, which can produce an authentic, fresh dough stone-baked pizza in as little as 90 seconds. This collection of compact electric ovens can make anything from bread to roasts in just minutes. It is a quick oven with a small footprint, using just a 13amp plug. FRIMA UK is presenting its new countertop 112L VarioCooking Center – a two-pan piece, each with a 25-litre capacity, offering maximum flexibility in both production and à la carte. The 112L version can take the place of kettles, large pots, and griddles, fitting them all into one, saving 30% or more kitchen space. It's speed is four times faster than conventional cooking appliances and perfect for preparing 30 individual portions or thousands of meals, cooking overnight, and even pressure cooking. It is highly energy-efficient, saving up to 40% compared to conventional cooking appliances. Its overnight cooking function allows for additional capacity - cooking without supervision, so food is ready in the morning when staff arrives, and leaving the Frima free for other cooking tasks throughout the day. It includes integrated cooking intelligence, which ensures perfect cooking results. For example, pasta is automatically lifted from the water at the end of the cooking time, and the unit will notify staff when pan fried foods need turning. Foodservice Equipment Marketing is showcasing the Manitowoc QM-45 - its latest integral storage ice-maker, which both makes and stores quality ice. It features a compact under-counter model that produces up to 43kg of ice in a 24-hour period, and storage capacity of up to 14kg. It includes maximum cooling and efficiency with its vertical evaporator. Bournville Catering Equipment introduces the Bournville Pod – made to serve both hot and cold snacks. It allows for maximum access and speed, with a faster service and as a result, faster sales. 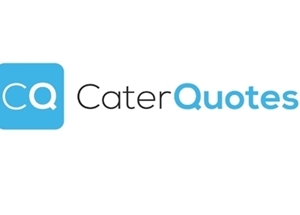 It is perfect for when you need a catering outlet away from the main restaurant, and need to reduce queues in the main catering areas. R H Hall Foodservice Solutions presents its new Covent Garden Soup Server, the UK’s first high-tech, fully automatic, and easy-to-use soup dispenser that offers fresh soup anywhere. With an easy-to-operate touch screen and simple cleaning, it is perfect for self-service. It can hold up to 12 litres for up to 12 hours. Dynamic is premiering its Turbo Attachment - the latest addition to its collection of stick blenders. This full-bodied, stainless steel piece is perfect for making soups, marinades, and sauces. It resembles a hammer, crushing the food and pushing it through the slots forcefully. It pulverizes stringy elements in your soup down to a smooth, velvety texture without having to sieve the ingredients saving its users both time and money. It enables you to crush easily, grind and mix food quietly and efficiently. It is easy to dismantle and clean. Hoshizaki Gram features its all-new hydrocarbon Emerald Range of ice makers that are both environmentally friendly and highly energy-efficient, including cube, flake and nugget machines with capacities ranging from 22-340kgs per day. Its models start from small under-counter machines and range all the way to large size stand-alone units. Regale Microwave Ovens introduces its Microsave Cavity Protection System, the only easy-to-use liner with a Worldwide NSF Certification and an ‘Approved Product Status’ by the Craft Guild Chefs. It provides total protection for the cavity, the roof, sides, back, and base of a commercial microwave oven. This saves hundreds of pounds in repair costs which are not covered by the manufacturer’s warranty, as well as valuable time by keeping the oven clean and hygienic. It is pot-wash and dishwasher friendly. Aqua Cure is exhibiting Pentair’s new Everpure Claris Prime filter, which includes water conditioning technology, both mineral adaptation and stabilization, and corrosion inhibition. It is perfect for espresso coffee machines and combi steam ovens, and can handle a variety of different flow rates. It cleans off dissolved solids, protecting your equipment from scale and mineral induced corrosion. Purified Air introduces its Electrostatic Precipitators (ESP’s), which can filter up to 98% of all oil, grease and smoke down to sub-micron levels in any commercial kitchen. They include integrated reserves which collect built-up oil, grease, and smoke particulates filtered from the exhaust. 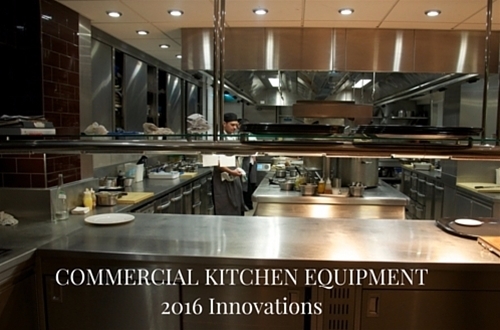 As the world becomes more technology driven, so does commercial kitchen equipment. It is ever-evolving and improving to make kitchen work and service much more streamlined. 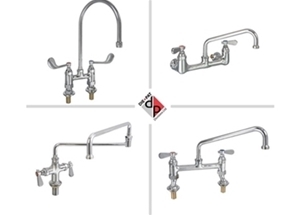 There are many fantastic brands of modern industrial kitchen equipment available. Keep some of these top-notch brands in mind for your next kitchen renovation or investment. 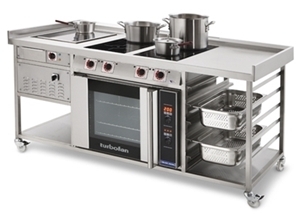 Choosing the best product for your commercial kitchen will result in increased revenue and an easier workload.